Veteran keyboardist and producer George Duke remembers a time when funk was a powerful force - not just in popular music but in social discourse. A careful balance of rhythmic energy and simmering balladry, Dukey Treats recalls the golden age of funk and soul, while at the same time maintaining a fresh sound and addressing issues that are relevant to the global culture of the 21st century. Veteran keyboardist and producer George Duke remembers a time when funk was a powerful force - not just in popular music but in social discourse. Frequently with a measure of wit and irony, and often with a strong dose of positivity at the core, titans like James Brown, Sly and the Family Stone and other funk icons of the '60s and '70s boldly addressed societal concerns ranging from poverty to racial disharmony to the battle of the sexes. Duke invokes that same combination of wit and wisdom in Dukey Treats (HUCD 3143), his debut on BPM/Heads Up International set for worldwide release on August 26, 2008. A careful balance of rhythmic energy and simmering balladry, Dukey Treats recalls the golden age of funk and soul, while at the same time maintaining a fresh sound and addressing issues that are relevant to the global culture of the 21st century. "I didn't want to drift too far away from the old school sensibility," Duke explains. "That was my main objective. I wanted to do an album where everybody went into the room at the same time and played. That's important, because the personalities of the musicians come through, and it's not just a progression of different musicians coming in one at a time, sitting down in front of a computer and laying down a track." Among the numerous treats on this album are not just the songs themselves but the roster of high-profile personnel helping to bring them to life - many of them alumni of Duke's earlier bands and projects. Included on the guest list are bassist Christian McBride, percussionist Sheila E and trumpeter Michael "Patches" Stuart, to name a few. Along with Duke himself, the vocal crew includes Jonathan Butler, Howard Hewett, Teena Marie, Rachelle Ferrell and more. The high-energy opener, "Everyday Hero," is a song of praise for the various unsung and under-recognized figures who move in and out of our lives every day - police officers, firefighters, doctors, teachers and countless others who make contributions that often go unnoticed. "This is the first tune I wrote for the album," says Duke. "I wanted something funky that had something relevant to say. It's sort of a Sly Stone vibe, only on steroids." "A Fonk Tail," an intergalactic epic full of over-the-top comic moments, is Duke's nod to Parliament/Funkadelic, who perfected the caricature of the cosmic funk hero back in the early '70s. "I've often wondered what happened to funny funk," he says. "What happened to the fun and comedy in R&B. This track is recorded in that old-school tradition." The title track is one of two songs recorded with Duke's original Dukey Stick band (the other being "Mercy," just a couple tracks later). On hand are guitarist Jef Lee Johnson, bassist Byron Miller, drummer Leon "Ndugu" Chancler and percussionist Sheila E. Duke who trades vocal lines with Josie James, Lynn Davis, Darrell Cox and Napoleon "Napi" Brock, while trumpeter Michael "Patches" Stuart (a longtime Marcus Miller sideman) rounds out the four-man horn section. "This one has all the loose talk and fun we used to have back in the day," says Duke. The comical "Creepin'," which features Christian McBride on upright bass, is a rearrangement of a song that first appeared on Duke's 2002 recording, Face the Music. "I did a remix of the song, and I had been sitting on it for a while. It's a humorous look at sneaking around on your significant other, with the girls pitted against the guys." On the more serious side, "Sudan (It's a Cryin' Shame)" deals with the human tragedy that continues in Darfur. "Joining me to sing about it is Jonathan Butler and Teena Marie," says Duke. "The song is not so much a political statement as an awakening to the tragic situation being perpetrated there." "Are You Ready," the followup to "Sudan," is Duke's nod to the message of global unity intrinsic in the music of Earth, Wind & Fire. "What I always loved about their style was not just the great music but also the positive messages - peace, respect and tolerance. It's a fitting song to follow 'Sudan,' as it is up to all of us to call attention to these injustices wherever they occur. The title asks the question: 'Are you ready to make a change?'" The closer, "Images of Us," is essentially "a long keyboard solo," Duke explains. "It's a jazz/funk instrumental that gives me the chance to build a solo over an extended period of time, something more than the thirty seconds before the singing starts again. The tune is basically a jam vehicle for the rhythm section over a sometimes-syncopated bass pattern. I wanted to include a songwhere I could just dig deep and play." 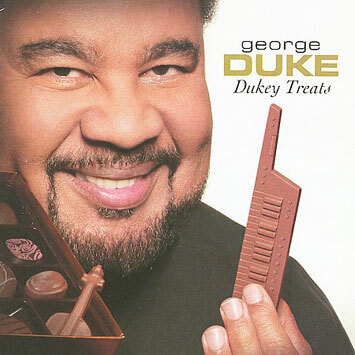 Digging deep and coming up with great music is what George Duke has always been about, and Dukey Treats is no exception. It's a fun and entertaining ride, to be sure, but underneath the occasional tongue-in-cheek posturing and comedic moments - the stuff that made R&B and funk so engaging in the first place - is music of substance that speaks to both the lighter and darker sides of the world we live in. "I feel a responsibility to carry positive messages in my music," says Duke. "I think music is meant to lift people up. I don't think you can push things under the rug and not address them. Those who have the ability and the opportunity to let people know what's going on musically and socially should not be afraid to say it and do it and play about it and sing about it." No tricks here. Just plenty of Dukey Treats. "aural nutrients for the mind, body and soul that when administered correctly can lead to mental, physical and spiritual healing - and cause a tinglin' in yo hip bone - uh, did I say somethin'?" My new CD is a celebration of "old school" with a new school twist seen through my minds eye. The central idea was to make the album as funky as it is beautiful. 1. Everyday Hero - This is the first tune I wrote for the album. I wanted something funky that had something relevant to say. It is sort of a Sly vibe on steroids. Young Ron Bruner kicks it off and is shortly joined by Jef Lee Johnson-guitar, Mike Manson-bass, and me. Rachelle Ferrell and Lori Perry chime in from time to time extolling the many everyday heroes who are generally taken for granted. The tune is really an instrumental "everybody funk together" kind of tune with vocal fills - and I LOVE IT!! 2. I Tried To Tell You - gives me the chance to play some sensitive Dukey piano and lead synth on what is a classic R&B ballad vibe. The song also features Josie James and Dee Dee Foster on vocals. 3. A Fonk Tail - The history of the intergalactic fonk expeditions and the birth of "Ooh". I think this narrative is self-explanatory. I've often wondered what happened to "funny funk"? What happened to fun & comedy in R&B? This track is recorded in that old school tradition. 4. Dukey Treats - was recorded with my original "Reach For It" band and has all the lose talk and fun that we had back in the day. On hand was Ndugu-drums, Byron Miller-bass, Sheila E-perc, Josie James, Lynn Davis, Napi-vocals and Sweet D. Rounding out the original band was Jef Lee Johnson on guitar as Icarus couldn't make the session. 5. Listen Baby - is a smooth Marvin Gaye type cut where I sing in my falsetto voice. Michael "Patches" Stewart plays muted trumpet throughout giving the song that real soulful smooth jazz type feel. Just lay back and let the vibe groove you. 6. Mercy - Once again my original "Dukey Stick" band takes the stage for the second time with the singers exchanging lines the way we used to back in the day. Special guest guitarist Wah Wah Watson joins the band doing what only he can do! Kamasi Washington, a talented young tenor sax player joins in playing that jazz thing - I just love jazz in my fonk! 7. Somebody Laid It On Us - One of the more serious songs in the package deals with the origins of greed. Greed and envy are the reasons for most of the problems in the world today - in short it is killing us physically and spiritually! 8. Creepin' ghoulie mix - The tune was originally recorded for my Face The Music" CD. I decided to remix it with a different intent. Many of my original funk band members participated along with Howard Hewett and Lori Perry. The song deals with the funnier side of cheating. (oh well). 9. Right On Time - is written in the style of "No Rhyme No Reason". Once again I'm singing in my falsetto voice and Rachelle Ferrell absolutely throws down at the end of the song. Wayman Tisdale plays the Bass Fills and is quite fonky. I play some nice jazz piano and by the time the bridge comes around, I'm not just knee deep in the fonk - my synth solo is submerged in the fonk - hello! 10. Sudan - Another one of the more serious songs on the album, which deals with the human tragedy that has been carried out in Darfur. Joining me to talk about it is Jonathan Butler and Teena Marie. The song is not as much a political statement as it is an awakening to the tragic human situation being extolled there. 11. Are You Ready - is very much in the style of and a tribute to Earth, Wind and Fire. What I always loved about their style was not just the great music but also the positive messages - peace, respect, and tolerance. It is a fitting song to follow Sudan as it is up to all of us to call attention to these injustices wherever they occur - are you ready? 12. Images Of Us - is a jazz/funk instrumental that gives me the chance to build a keyboard solo over an extended period of time. The tune is basically a jam vehicle for the rhythm section over a sometimes-syncopated bass pattern. OK - that's the album. I want you to know that I had a great time making this album and I hope you enjoy it as much as I do - Peace Out! The scope of keyboardist-composer-producer George Duke's imprint on jazz and pop music over the past forty years is almost impossible to calculate. He has collaborated with some of the most prominent figures in the industry. A producer since the 1980s, he has crafted scores of fine recordings - many of them GRAMMY? winners - for artists representing almost every corner of the contemporary American music landscape. Duke was born in San Rafael, California, in January 1946. When he was four, his mother took him to a performance by that other Duke of jazz, Duke Ellington. He admits that he doesn't remember much of the performance, but his mother told him years later that he spent the next several days demanding a piano. Duke began his formal training on the instrument at age seven, his earliest influence being the culturally and historically rich black music of his local Baptist church. By his teen years, his universe of musical influences had expanded to include the more secular sounds of young jazz mavericks like Miles Davis, Les McCann and Cal Tjader - all of whom inspired him to play in numerous high school jazz groups. After high school, he attended the San Francisco Conservatory of Music and received a bachelors degree in 1967. But perhaps the most important lessons came after college, when Duke joined Al Jarreau in forming the house band at the Half Note, the popular San Francisco club, in the late '60s. He also played with Sonny Rollins and Dexter Gordon in other San Francisco clubs around the same time. For the next several years, Duke experimented with jazz and fusion by collaborating and performing with artists as diverse as Jean Luc-Ponty, Frank Zappa, Cannonball Adderley, Nancy Wilson, Dizzy Gillespie, Billy Cobham and Stanley Clarke. He launched his solo recording career at age 20, and shortly thereafter began cutting LPs for the MPS label in the '70s. As the decade progressed, he veered more toward fusion, R&B and funk with albums like From Me To You (1976) and Reach For It (1978). During this period he recorded what is possibly his best known album, Brazilian Love Affair. Released in 1980, the album included vocals by Flora Purim and Milton Nascimento, and percussion by Airto Moreira. Love Affair stood in marked contrast to the other jazz/funk styled albums he was cutting at the time. Duke's reputation as a skilled producer was also gathering steam. By the end of the '80s, he had made his mark as a versatile producer by helping to craft recordings by a broad cross section of jazz, R&B and pop artists: Raoul de Souza, Dee Dee Bridgewater, A Taste of Honey, Jeffrey Osborne, Deniece Williams, Melissa Manchester, Al Jarreau, Barry Manilow, Smokey Robinson, The Pointer Sisters, Take 6, Gladys Knight, Anita Baker and many others. Several of these projects scored GRAMMY? Awards. During this time, Duke was just as busy outside the studio as inside. He worked as musical director for numerous large-scale events, including the Nelson Mandela tribute concert at Wembley Stadium in London in 1988. The following year, along with Marcus Miller, he served as musical director of NBC's acclaimed late-night music performance program, Sunday Night. The '90s were no less hectic. He toured Europe and Japan with Dianne Reeves and Najee in 1991, and joined the Warner Brothers label the following year with the release of Snapshot, an album that stayed at the top of the jazz charts for five weeks and generated the top 10 R&B single, "No Rhyme, No Reason." Other noteworthy albums in the '90s included the orchestral tour de force Muir Woods Suite (1993) and the eclectic Illusions (1995), in addition to the numerous records Duke produced for a variety of other artists: Najee, George Howard, the Winans, and Natalie Cole (Duke produced 1/3 of the material on Cole's GRAMMY?-winning 1996 release, Stardust). In 2000, Duke severed his ties with Warner Records and launched his own record label, BPM (Big Piano Music). "I spent thirty years at other labels as a recording artist," he says. "I felt it was time for me to step up to the next level of challenge and form a company that would give me and other artists the opportunity to create quality music and push back the musical restraints that dominate most record labels these days." But even with the new responsibilities and challenges associated with running a record label, Duke has continued to juggle the multiple career tracks of recording solo albums, international touring and producing records for other artists. In addition to his own Face the Music (2002), he also produced recent records for Wayman Tisdale, Dianne Reeves, Kelly Price, Regina Belle and Marilyn Scott. For the better part of 25 years, Duke has also composed and recorded numerous scores for film and television. In addition to nine years as the musical director for the Soul Train Music Awards, he also wrote music - either individual songs or entire soundtracks - for a number of films, including The Five Heartbeats, Karate Kid III, Leap of Faith, Never Die Alone and Meteor Man. With more than thirty solo recordings in his canon and a resume that spans more than 40 years, Duke joins forces with the Heads Up label with the August 26, 2008, release of Dukey Treats, a return to the old-school funk sensibilities of icons like James Brown, Sly and the Family Stone and Parliament/Funkadelic. A careful balance of rhythmic energy and simmering balladry, Dukey Treats recalls the golden age of funk and soul, while at the same time maintaining a fresh sound and addressing issues that are relevant to the global culture of the 21st century.